ESE wants to recognize school News teams that use the ESE platform! Whether you broadcast live or pre-record your Newscast, we encourage all News teams to enter. This contest will be a People’s Choice giving your friends and family the opportunity to vote for you. Entries will be posted to the ESE Facebook page and the submission with the most “likes” wins! You deserve recognition and bragging rights for all of your hard work. Enter today to become ESE’s May News Team of the Month. 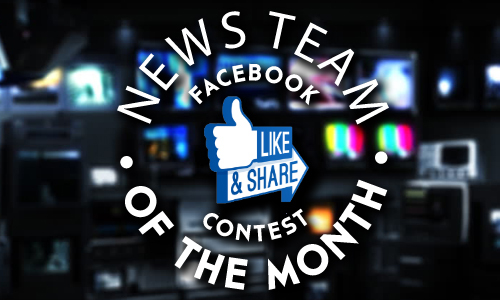 An entry includes a picture or short clip of your news team in action and 1-3 sentences about why your News team should win ESE’s NTOTM for the month. How to enter: Post your entry onto the ESE Networks Facebook page. When to enter: Entries will be accepted from Monday, May 2 until Friday, May 6 @ 5 PM ET. On May 9th, all of the entries will be re-posted to ESE Networks’ Facebook page. Voting will take place from Monday, May 9th to Friday, May 13th at 5 pm. The entry post with the most “Likes” wins the contest. Share your school’s entry post to increase your chances of winning, and be sure all voters like the ESE Networks Facebook page as well in order for the “Like” to count.